From England. 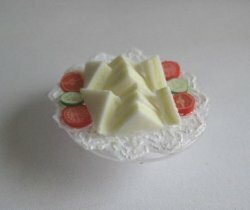 1/12th scale fresh cheese sandwiches with tomato and cucumber garnish on a quality glass cakestand and doily. 1-1/8" across.